Over the past couple of years, I have been reading more and more nonfiction, and I’ve grown to love it. And I’ve discovered that I love nonfiction that reads like fiction. It’s exciting and engaging instead of dry – which we all know history books can be – and it makes the story all that more memorable. In The Stowaway, Laurie Gwen Shapiro turns a true story into something that feels like an adventure novel. It was a thoroughly enjoyable – and educational – read. 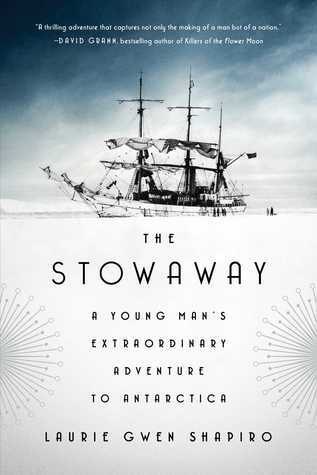 (From Goodreads) The spectacular, true story of a scrappy teenager from New York’s Lower East Side who stowed away on the Roaring Twenties’ most remarkable feat of science and daring: an expedition to Antarctica. I rarely pick up nonfiction books without being at least somewhat familiar with the topic (a terrible habit, I know). But, before reading The Stowaway, I had never heard of Billy Gawronski, and the name ‘Richard Byrd’ rang only a faint bell in the back of my mind. As fascinated as I am with the 1920s, I had sadly never delved into the exploration aspect of the age, and I am so glad that I got that from this book. It was absolutely fascinating to read about. My experience with traditional adventure stories is fairly limited, but this story is exactly what i would expect an adventure to be. I could definitely see how a young boy, reading stories like this, would feel compelled to join in. Shapiro brilliantly captured the electricity surrounding the expedition. But she also didn’t sugar-coat anything (even though that’s how Billy saw things, at least in the beginning). Not everything was easy, and I appreciated that the excitement of adventure was tempered by reality. It was an interesting experience, and one I really enjoyed. While the story itself is definitely the highlight of this book, the writing is also fantastic. This book was incredibly-well written and researched, and organized in a way that created suspense. It was hard to put down; I just wanted to find out what happened next. I think Shapiro did the story justice and made it more interesting than it might have been in the hands of someone else. It’s a story that deserves to be told, and she does it well. I also appreciated her attention to detail, and to making each character come to life. Overall, an excellent book. ★★★★☆ – I thoroughly enjoyed The Stowaway. I haven’t had this much fun reading a history book in a while, and I’m so glad I decided to read this one. It did drag a bit towards the end (hence the four stars), but I think that was the nature of the story – the adventure is kind of over – rather than the fault of the author. If you’re looking to start out with nonfiction, I think this is a great introduction since it was such a quick and fun read. The Stowaway will be in bookstores starting January 16, 2018. You can preorder your copy on Amazon now. To get the audiobook for free, use this link to sign up for a free trial of Audible and choose The Stowaway as one of your two free books. This story sounds so fascinating. I think I would enjoy a true story about a stowaway. Great review, thanks for sharing your honest opinion! Yes this sounds awesome! I just added it to me list. Thanks matey! Definitely! It’s a really great pick if you don’t read a lot of nonfiction, because it feels a bit like fiction. I hope you enjoy it!